Cheap Mama Chick: Gluten Free Deals + $10 Credit! Gluten Free Deals + $10 Credit! Gluten Free deals to be found with a FREE $10 Vitacost credit! Grab a free $10 credit to Vitacost when you sign up HERE (new customers only)! Make sure to check your email for the credit after you enter your email address at Vitacost. 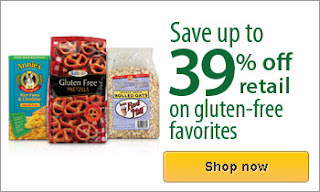 Hundreds of Gluten Free Items are up to 39% off this week. Combine those discounts with your $10 credit for some great deals on normally pricey items! There are so many items to choose from! Keep in mind the $10 credit is good site wide not just on Gluten Free. Grab a free $10 credit to Vitacost when you sign up HERE (new customers only)! Name Brand Infant/Children's Shoes $5 Shipped!